Are you memorising huge chunks of notes to no avail at the exams? Having trouble understanding and applying concepts? As a former JC lecturer and Olympiad trainer, I understand why you are in this predicament, and I can help you. My students come from a diverse background of JCs, RI, ACJC, SAJC, PJ and JJC, and have made marked improvement, achieving As and Bs for their A level examinations. I have 10 years of teaching experience in JCs and over the years have developed a method for students to succeed. 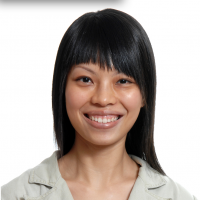 Ms Lim is a highly dedicated teacher who will go above and beyond the responsibilities required of a teacher. She puts in tremendous effort into guiding and teaching me and never stops pushing me forward even when I was unconfident and demotivated. She was also very patient and did not mind giving me recaps on chapters that I did not fully understand or even forgotten. She would also mark practice papers that I had done sacrificing her own free time so she would be able to go through and helped improved on areas I was weak on or help clear up any misconception I had by the time I came. She took her time to write an extremely comprehensive summary as well as a checklist which helped me greatly before my 'A' Levels as it enabled me to study smarter. Thanks to her clear explanations, which helped made intimidating concepts easier to understand, as well as her vast experiences which helped her to identify my weak points and common mistakes, I was able to achieve a 'B' - a huge improvement from the 'S' grade I had gotten in Prelims. I am extremely thankful for her help as without it, I am sure I would not have been able to grasp the difficult concepts in time for my A Levels and would definitely not have done as well. I highly recommend her as a Chemistry tutor! Ms Lim is a tremendously dedicated teacher who is extremely patient towards slower students such as myself. Within a short span of one year, she has managed to lift my grades from a grisly ‘S’ grade in my Common Test to an ‘A’ grade in A-levels; I simply cannot thank her enough. I was never a good Chemistry student; my O-level grade for Chemistry was B3, and I never got higher than a ‘D’ grade for Chemistry throughout my first year in JC. I was going to Ms Lim’s classes with a wobbly foundation, yet she was able to quickly solidify my fundamental Chemistry knowledge, allowing me to better understand lectures and tutorials. I cannot stress how patient Ms Lim was; she would explain topics that I did not understand through different viewpoints, helping me to fully comprehend those topics. Ms Lim never fails to convey complicated theories and topics in an easily-comprehensible manner, which was very helpful for simple-minded learners like me. Ms Lim’s lessons were also systematic and well-coordinated with my school’s academic timeline, allowing me to immediately apply my new-gained knowledge from her lessons into my schoolwork. Knowing that I am a visual learner, Ms Lim would also prepare slides prior to our lessons, helping me to better grasp major concepts in Organic Chemistry such as Enantiomerism. Ms Lim has been a really astounding mentor and I am more than lucky to have found her as my tutor in my A-Level year. I strongly recommend her as your Chemistry tutor! Ms Lim is one of the most dedicated teachers I have ever met. Her passion for teaching is unsurpassed. She always offered to mark my work and added loads of comments to ensure that I got the right concepts as well as numerous tips and tricks to increase my efficiency in answering questions. She even helped handwrite a summary on all the important points for each of the topics for me in a short span of time of a few days to help me study 'smart'. If this does not display her dedication to helping her students score well, I don't know what does. Any student would be blessed to have her as their chemistry tutor. I have always been weak in chemistry. During my 2 years in AJC , I struggled to pass my chemistry tests even after I have tried my best to memorise my notes many times over. In the end, I got a D (chemistry) for my A levels. Refusing to give up, I decided to retake my A levels chemistry exam again as a private candidate, this time with the recommended help of Ms Lim. I feel so much more confident for my paper and I give all the credit to my chemistry tutor. Upon realising just how weak my foundation knowledge in chemistry was during the first lesson, Ms lim gave me simple advice on how to approach the subject effectively and she patiently guided me through all the basic concepts. There was so much that I didn't know and I am glad Ms lim was there to help me identify and solve my many issues and misconceptions. I appreciate how her vast experience in teaching chemistry allows her to make difficult and (initially) intimidating concepts so much easier for me to digest. She would also often alert me on the commonly made errors her students had made in the past so that I will not commit the same mistakes. As a student, I find that this truly accelerated my learning and deepened my understanding of the subject. She never fails to thoroughly check the work that I give her and return them to me riddled with red ink telling me exactly how I can improve my answers to score better during my actual exams. By the time my chemistry exam came, I felt more confident than I have ever felt before. As an ex student of hers, I strongly recommend her as a chemistry tutor ! I have been failing my chemistry since J1, and it is the first time I pass was only near prelim (after I had lessons with Ms Lim) and I have got a B for my A-levels and I'm still very thankful for her help! She is very sincere and helpful, her explanations allows me to understand the concepts better and she also marks my work and make sure I'm prepared for the exams. Without her perseverance and faith in me that I can do well, I wouldn't have able to pass chemistry at all. ManyTutors will check with Raene Lim and will get back to you.